Siena is a historic town in Tuscany, Italy that has been identified and declared as a World Heritage site by UNESCO. It enthralls visitors with its art, museum, cityscape of the medieval era and the delicious cuisine. The Palio, a horse race typical of Siena which is held twice a year, is yet another reason for its popularity. Historical evidences suggest that Siena was founded by Senius, son of Remus, one of the two legendary founders of Rome. Siena hosts the emblem of a she wolf, which suckled Remus and Romulus. Typically, statues of this scene are seen depicted in many parts of Siena city. Sitting over the hills with its heart as the huge Piazza, Siena was rebuilt during the rule of quasi democratic group from 1287 to 1355 and a fan-like brick pavement represents the council and symbolizes the nine Madonna cloaks - which sheltered Siena. At the heart of Siena central is Piazza known as Il Campo, where the world renowned Palio festival takes place every summer. The red Palazzo Pubblico and its tower Torre del Mangia and the Duomo were built during the same period of rule. They are housed in the shell-shaped Piazza del Campo, the town square. The civic palace houses the city's municipal offices. There is also a civic museum here. Palazzo Pubblico is considered an architectural treasure. A savvy tourist can climb about 500 steps to view wonderful Siena and its surroundings from this museum. This museum is the place for some of the greatest Sienese paintings. The Sala del Concistoro houses one of the Domenico Beccafumi's best works, ceiling frescoes of allegories of the virtues of Siena's medieval government. Simone Martini holds Maesta and equestrian portrait of Guidoriccio da Fogliano and Ambriogio Lorenzetti's Allegories of Good and Bad Government â€“ an important cycle of secular paintings of Middle Ages. Siena's cathedral is one of the greatest examples of Italian Romanesque Gothic architecture. Originally intended to be the largest cathedral in the world, the main faÃ§ade of this cathedral was completed in 1380, which quite unusually holds an axis north-south. Another place of visit is the famous Gothic octagonal pulpit by Nicola Pisano supported by lions. A perfectly preserved renaissance fresco by Domenico Ghirlandaio lies beneath the Duomo in the baptistry. The Muses dell' Opera del Duomo contains Duccio's famous Maesta and other world class works by Sienese masters. Siena's scenic gardens include the Orto Botanico dell'Universita di Siena, a botanical garden which is maintained by the University of Siena. A Medicean fortress has the Enoteca Italiana and the Siena Jazz School. Here courses and concerts are held all year round. The Monte dei Paschi di Siena is one of the oldest banks in continuous existence and plays a major role in the economy of this place. The sanctuary of Santa Caterina has the old house of St Catherine of Siena. The miraculous Crucifix from the saint received the stigmata and a 15th century statue of St Catherine. There are numerous villas including the Villa Chigi, Castle of Belcaro, Villa Celsa, Villa Cetinale and Villa Volte Alte, all attributed to Baldassarre Peruzzi. A traveler can well step into the middle ages of history with a visit to Siena. This magnificent hill town, with its many cathedrals and frescoes, marvelous marble floors and astonishing artworks, is sure to leave the tourist spell bounded. 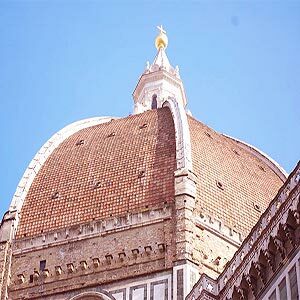 And there are numerous daily trains that connect this medieval city with Florence which is located just 43 miles to the north.